Texas sage (Leucophyllum frutescens), also called Texas Ranger or purple sage, is a drought-tolerant, semi-evergreen, woody shrub that is native to northern Mexico, New Mexico and the Chihuahuan Desert of Texas. Featuring 1-inch-long oval, silvery green, fuzzy leaves and purple, white, blue or pink bell-shaped flowers, it grows as an ornamental in U.S. Department of Agriculture plant hardiness zones 7 through 11. Because humidity after summer rains stimulates flowering, the plant is also known as barometer bush. 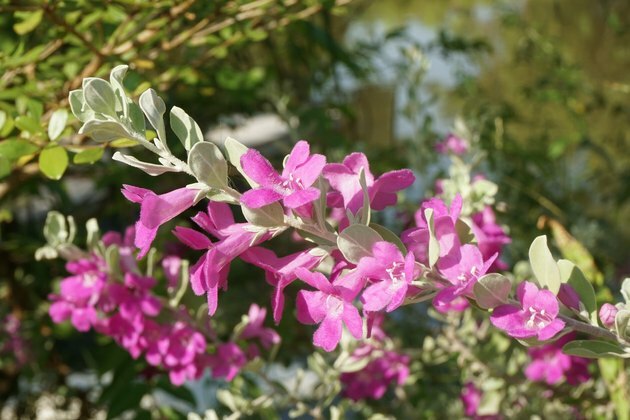 Texas sage needs four to six hours of sun each day and well-draining soil. It will tolerate soil of any pH but thrives in soil with naturally occurring lime or shell. Soil with limestone or shell usually has a pH between 7.0 and 8.2, which is slightly alkaline. Don't worry if you're not sure what pH level your soil is, though, as Texas sage will adapt just fine to any type of soil so long as it's not soggy. When planting a Texas sage, don't add any fertilizer or compost to the soil. This plant is quite self-sufficient. It doesn't need fertilizer and it may refuse to flower if you give it any. Reaching around 8 feet tall and wide at maturity, a Texas sage bush needs some room. Plant individuals at least 3 feet apart from each other, 3 feet from foundations and 4 feet from paths, walkways and driveways. Water newly planted Texas sage every five to seven days for a few weeks until it's well established, allowing the top 2 inches of soil to dry out between watering sessions. After that, rainfall should be enough in most climates. If rainfall is below average, water the plant in summer to promote flowering. Take care not to soak the plant when watering — just give it enough water to moisten the top layer of soil. Water only when you absolutely must and avoid winter watering. Remember: This is a desert plant that will suffer and possibly die if overwatered. Texas sagebrush is a slow-growing plant, so an occasional trimming of wayward branches is all that is needed to keep it looking tidy. Use hand pruning shears to trim the plant when it has finished flowering. You can also give it a hard prune in early spring, cutting it back by two-thirds by making alternate branch cuts of varied lengths to thin out the shrub. This will encourage vigorous growth and flowering the following season. Avoid using hedge trimmers or the temptation to shape your shrub into a block or other unnatural form. Doing so is likely to cause the plant to thin from the center. As always, sanitize pruning shears by spraying them with a household antibacterial spray before and after pruning to avoid spreading unseen diseases or fungi. Texas sage is a hardy plant with few problems. It's most common issue is root rot, and you can avoid that if you don't overwater the plant. Although not much bothers Texas sage, the plant could bother you. Texas sage is a potential allergen because the tiny matted hairs of the woolly leaves tend to capture large amounts of dust particles. These are easily inhaled when handling the plant. You can avoid this if you wear a dust mask when working with and around the shrub. Use Texas sage with other sun-loving plants, such as the drought-tolerant queen sago palm (Cycas circinalis) which grows in USDA zones 9 through 10. Ice plant (Carpobrotus chilensis), also known as sea fig, is a succulent, dense ground cover that grows in USDA zone 10 that provides textural contrast and visual interest when planted with Texas sage in the background. It's invasive in some areas, though, so check before planting. For low-water gardens in USDA zones 7b through 11, consider desert willow (Chilopsis linearis) as a companion for Texas sage. This tree grows willowy foliage and reaches an average height of 20 to 30 feet. Because of its white, pink or lavender tube-shaped flowers, the tree is also known as orchid of the desert.